Longstanding Brazilian federal law gives police officers exceptionally broad scope to claim self-defence to allegations of culpable homicide. According to Brazil’s 1988 Constitution, everyone has the right to life and to physical integrity.Art. 5, 1988 Constitution: "Todos são iguais perante a lei, sem distinção de qualquer natureza, garantindo-se aos brasileiros e aos estrangeiros residentes no País a inviolabilidade do direito à vida, à liberdade, à igualdade, à segurança e à propriedade. "No one shall be subjected to torture or to cruel, inhuman, or degrading treatment or punishment.Art. 5(III), 1988 Constitution: "ninguém será submetido a tortura nem a tratamento desumano ou degradante. "Nobody will be held in custody unless there is a warrant for arrest issued by a judge with the requisite jurisdiction or unless the person was arrested in the process of committing a crime.Art. 5, (LXI), 1988 Constitution: "ninguém será preso senão em flagrante delito ou por ordem escrita e fundamentada de autoridade judiciária competente..."
The Brazilian Constitution establishes that the military police are responsible for the preservation of public order and for policing.Art. 144(V), 1988 Constitution: "Às polícias militares cabem a polícia ostensiva e a preservação da ordem pública; aos corpos de bombeiros militares, além das atribuições definidas em lei, incumbe a execução de atividades de defesa civil." The regulation of police use of force exists at both federal and state level in Brazil. The 1941 Criminal Procedure Code establishes the principle of use of force in self-defence (“auto de resistência”) whereby force shall not be used except in the case of “resistance” or else in thwarting the attempted escape of a prisoner.Art. 284, 1941 Criminal Procedure Code (Código de Processo Penal DECRETO-LEI 3.689/1941 03.10.1941, Art. 284).The law further states that "if there is resistance to arrest", law enforcement officials can "use whatever means necessary to defend themselves or to overcome resistance".Art. 292, 1941 Criminal Procedure Code.It is asserted that this law has been used consistently in certain parts of the country to evade accountability for police killings.See, e.g. the 2009 report by Human Rights Watch,“Lethal Force”, which states that: "In nearly all cases in Rio and São Paulo in which police have killed people while on duty, the officers involved have reported the shootings as legitimate acts of self-defense, claiming they shot only in response to gunfire from criminal suspects. In Brazil, these cases are referred to as “resistance” killings. Given that police officers in both states do often face real threats of violence from gang members, many of these “resistance” killings are likely the result of the use of legitimate force by the police. Many others, however, are clearly not." At: https://www.hrw.org/report/2009/12/08/lethal-force/police-violence-and-public-security-rio-de-janeiro-and-sao-paulo. A 2014 federal statute ostensibly regulates the use of less-lethal weapons by law enforcement officials but also addresses the use of firearms. It calls for security agencies to prioritise the use of less-lethal weapons, provided that their use does not endanger the physical or mental integrity of police officers. Use must comply with the principles of legality, necessity, and reasonableness and proportionality.Art. 2, Federal law on Police Use of Less-lethal Weapons, Statute Nº 13.060 of 22 December 2014.It is not lawful to use firearms against a person fleeing who is unarmed or who does not represent an immediate risk of death or injury to public security agents or third parties, or against a vehicle that disrespects a police blockade on public roads, except when the act represents a risk of death or injury to public security agents or third parties.Art. 2(1), Federal law on Police Use of Less-lethal Weapons, Statute Nº 13.060 of 22 December 2014. 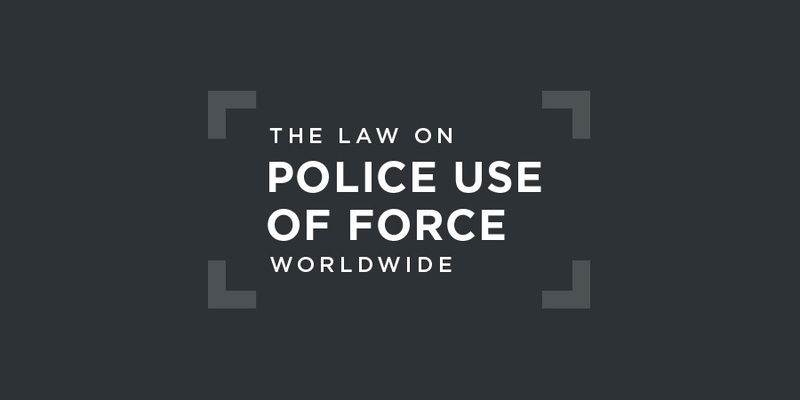 According to 2010 national interministerial guidelines on the use of force by law enforcement officials,Portaria N° 859, 31 December 2010.use of force must respect the principles of legality, necessity, proportionality, moderation, and appropriateness ("convenencia"). Officers "should not discharge firearms against persons except in cases of legitimate self-defense or imminent threat of death or serious injury." So-called "warning shots" are not considered acceptable because of the "unpredictability" of their effects. The ordinance also requires that an officer carry at least two less-lethal weapons. 1. In the course of an arrest, to disregard the constitutional rights of the person who is being arrested.Art. 13(1): "desconsiderar os direitos constitucionais da pessoa no ato da prisão". 2. To unnecessarily use force in the course of an arrest or of a police action. Art. 13(2): "usar de força desnecessária no atendimento de ocorrência ou no ato de efetuar prisão". 3. To fail to respect the physical integrity of the person arrested or detained.Art. 13(3): "deixar de providenciar para que seja garantida a integridade física das pessoas que prender ou detiver". 4. To assault physically, morally, or psychologically a detained person under an officer's supervision or to allow any other person to do so.Art. 13(4): "agredir física, moral ou psicologicamente preso sob sua guarda ou permitir que outros o façam". Resolution SSP-05/2013, which was passed by the São Paulo Public Security Secretariat on 7 January 2013, requires the police to call for emergency assistance immediately after shooting in order for emergency services to treat injured victims and to prevent police from removing victims from the locations where they were shot or injured. Military police are required to secure the locations of the killings and immediately notify the civil police who are charged with investigating the occurrence, and interviewing all of those involved. The new policy requires that forensic investigators go to shooting sites immediately upon being informed of a police shooting and homicides are to be recorded as “homicides resulting from police intervention” rather than “resistance” killing.According to Article 3: When police records, incident reports, crime reports and police inquiries are drawn up, Police Authorities should refrain from using the terms "resistance", "resistance followed by death" and similar expressions, which should be replaced, depending on the case, for "bodily injury resulting from police intervention" and "death resulting from police intervention".The policy was criticised on a number of points and on 16 May 2013 the Military Police issued a revised Standard Operating Procedure that permits police officers to remove shooting victims from crime scenes in two circumstances: first, in the absence of emergency health services; and second, with the express authorization of the Military Police Commander in cases in which the emergency response time is “inadequate". State-level regulations also exist with respect to use of force by Rio de Janeiro´s Military PoliceRegulatory Instruction PMERJ/EMG-PM3 Nº 044 of October 2015. Guidance on “when the Police should shoot"
I. In self-defence by a police officer or citizen at risk. II. When there is resistance to arrest with the use of firearm or other lethal weapon. Article 2 - The police officer must be aware of the principles that involve the firing of firearms, being sure that every shot must be justified to the administrative and/or judicial authorities, as the case may be. Article 3 - Excessive use of force and firearms by police officers shall be subject to administrative, civil and criminal penalties. II. Clearly warn about possible firing, with sufficient time for the warning to be understood, if such a procedure does not pose an undue risk to the police or to others. III. If there are victims, the police officer should, as soon as possible, provide the appropriate medical assistance. Art. 5 - "Warning shots" are expressly prohibited, since shooting at random is a crime, according to Article 15 of Federal Law No. 10,826/2003. Art. 6 - "Shots to prevent an escape", while the citizen is on foot or in a vehicle, are prohibited, except when the act represents a risk of death or injury to public security agents or third parties. In Brazil, the military courts have jurisdiction over cases involving military crimes defined as such by the Military Penal Code. This typically covers the actions of the Military Police. There is also the possibility of policemen committing “ordinary crimes.” In these cases, they can either be tried by the relevant state court or by the federal courts. II - to subject someone under their guard, power or authority, with the use of violence or serious threat, to suffer intense physical or mental treatment, as a form of punishment or as a preventive measure. The penalty on conviction is a term of imprisonment from between two and eight years. Anyone who subjects a person arrested or under a security measure to physical or mental suffering, or any act not permitted by law or not resulting from a legal measure incurs the same penalty. In addition, anyone who fails to act in the face of this type of conduct when they had a duty to prevent it or to investigate the offender, incurs a sentence of imprisonment of one to four years. If physical injury of a serious or very serious nature occurs, the sentence is imprisonment from four to ten years; if it results in death, the sentence is imprisonment from eight to sixteen years. It is further stated that torture is a serious crime and may not the subject of a pardon or amnesty. The former attorney general of São Paulo state, Fernando Grella Vieira, expanded the mandate of the Special Task Force on Police Control (GECEP), a unit within the state prosecutor’s office, instructing it to investigate alleged abuses committed by military police officers.See, e.g., https://www.hrw.org/news/2013/07/29/letter-governor-alckmin-and-attorney-general-marcio-rosa-about-police-violence.One consequence of the new mandate is the creation of a database of cases to help prosecutors identify patterns of police violence. Prosecutors participating in the GECEP are required to, among other actions, to register in the Institution's database and to analyse the occurrences of possible offenses by state agents that have resulted in death, torture or injury.Art. 3(XVIII), Ato Normativo Nº 650/2010-PGJ-CPJ, 18.06.2010, at: http://biblioteca.mp.sp.gov.br/PHL_IMG/Atos/650.pdf. From 1999 to 31 March 2012, the Rio Police Ombudsman’s Office recorded more than 11,300 complaints against police officers concerning criminal conduct. These complaints generated only 43 criminal charges by state prosecutors and four convictions.See: https://www.hrw.org/news/2012/06/14/brazil-letter-governor-cabral-police-violence. The “Juan” case led to the introduction of new guidelines on the investigations into “resistance killings” in Rio de Janeiro. The disappearance of Juan de Moraes was one of many incidents of police violence in 2011. Mr de Moraes disappeared on June 20 after an incident in the Danon favela in which three others were shot by military police. No serious investigation into the shoot-out took place. It was only after considerable media attention that civil police investigated the scene of the shooting and sought out eyewitness testimony. They found Mr de Moraes’ DNA at the crime scene and other evidence which indicated that no shoot-out had in fact taken place. Ten days later, they discovered his body in a river. After this incident, the Civil Police Chief Martha Rocha introduced civil police regulations on “resistance” killing investigations. Regulation PCERJ Nº 553 of 7 July 2011 requires civil police to immediately isolate and analyse the crime scene; to test guns used by police during the operation that led to the shooting; to collect eyewitness testimonies, and to conduct separate interviews with all police officers involved.Regulation PCERJ Nº 553, at: http://www.adepolrj.com.br/adepol/noticia_dinamica.asp?id=17680. In its most recent concluding observations on Brazil's implementation of the ICCPR (in 2005), the Human Rights Committee expressed its concern about theHuman Rights Committee, Concluding Observations, UN doc. CCPR/C/BRA/CO/2, 1 December 2005, §12. widespread use of excessive force by law enforcement officials, the use of torture to extract confessions from suspects, the ill-treatment of detainees in police custody, and extrajudicial execution of suspects. widespread violence at the hands of the military police, the Pacifying Police Unit and the Special Police Operations Battalion, notably against children in street situations and children living in favelas, inter alia during “pacification” operations, the military operations in Maré in Rio de Janeiro, and the “shock of order” operation. The Committee was also gravely concerned aboutCommittee on the Rights of the Child, Concluding Observations, UN doc. CRC/C/BRA/CO/2-4, 30 October 2015, §36. the very high number of extrajudicial executions of children by the military police, “militias”, and the civilian police, and by the widespread impunity for these grave violations of children’s rights. to take all necessary measures, including by enacting or amending legislation and establishing corresponding mechanisms, to ensure the prompt and effective investigation of all deaths and injuries of children, including those that are considered so-called “acts of resistance”, resulting from the use of force by State agents. In doing so, the State party should consider the use of increased penalties for perpetrators with experience in law enforcement or security. The Committee also recommends that law enforcement and other State security personnel who are under investigation for crimes constituting extrajudicial execution, torture and/or enforced disappearance be removed from active duty. This case, which concerned police action in the Favela Nova Brasilia, the name given to a network of 15 favelas in northern Rio de Janeiro, was decided by the Inter-American Court of Human Rights in February 2017.Inter-American Court of Human Rights, Favela Nova Brasilia case v. Brazil, 16 February 2017.On 18 October 1994, the police carried out Operation Nova Brasilia in the Favela, which resulted in the deaths of 13 men and the sexual abuse of three girls. The official goal of the operation was to execute warrants that were not ultimately produced. A further operation seven months later, this time to intercept a local weapons trafficker, led to at least eight men being summarily killed by the police after surrender and a total of 13 fatalities. In its judgment, the Inter-American Court of Human Rights instructed Brazil to conduct an effective investigation into the murders. The Court also directed that “the expressions ‘opposition’ and ‘resistance’ must no longer be used in reports on killings that result from police intervention until an investigation conducted by independent experts confirms the events. In Brazil, these terms are routinely used in police reports to cover up abuse by agents of the State, placing the blame on the victims and limiting the investigations”. In April 2019, ten Brazilian soldiers were arrested after their army patrol opened fire on a car carrying a family in the city of Rio. Police accused the soldiers of firing more than 80 shots at the car, killing driver Evaldo dos Santos Rosa and injuring a passenger and a passer-by. Mr Rosa was driving his family to a baby shower in northern Rio. Investigators believe the patrol mistook the family's car for one of the same colour driven by gang members. Police who searched the family's car said no weapons had been found inside. The soldiers have been charged with "non-compliance with the rules of engagement" and will be tried by a military court. In July 2013, the construction worker Amarildo Dias de Souza, a habitant of the Rocinha favela, was taken by the Rio de Janeiro Military Police to a UPP unit (Unit of Pacifying Police) for questioning. He was never seen again. His family pressed for action and after three months of investigation the Rio de Janeiro´s Public Prosecution Service initiated a prosecution against 25 military policemen for the homicide of Amarildo. Twelve of the twenty-five police officers charged were convicted of torture followed by death and of hiding his body. On 2 October 1992, a dispute between detainees at São Paulos´s Detention House threatened to get out of hand. The São Paulo Military Police, which was called on to intervene, ended up killing 111 inmates.Source: http://www1.folha.uol.com.br/banco-de-dados/2017/10/1923603-ha-25-anos-massacre-do-carandiru-resultou-na-morte-de-111-detentos.shtml.This episode is known in Brazilian History as the “Massacre do Carandiru” (Carandiru Massacre). Some of the police officers involved were convicted at trial. The appelate courts, however, annulled the convictions. If the Public Prosecution Service does not manage to overturn this ruling in the Supreme Court, new trials will be held.